The New Kylie Bedding Range has now arrived at Surrey Blinds. It’s that time of the year, the nights are drawing in and everything just seems a little bit drab and colourless, so why not transform your bedroom with our New Kylie Range of bed linens and cushions. With luxurious textures and fabrics, and lots and lots of sparkle, its just what you need to bring star quality into your bedroom. Why not team the bed linens with stunning velvet curtains or roman blinds at the window and cute shimmery scatter cushions and bolsters to really complete the look. Here at Surrey Blinds we have a wide range of fabrics which will compliment any of the range, as well as beautiful curtain poles and tiebacks dripping with twinkling crystals, so you can really go to town on your decoration. To help you visualise how the New Kylie bedding Range could look in your home, why not pop in and see the display we have in our Guildford Showroom, it might be just what you need to beat the winter blues! 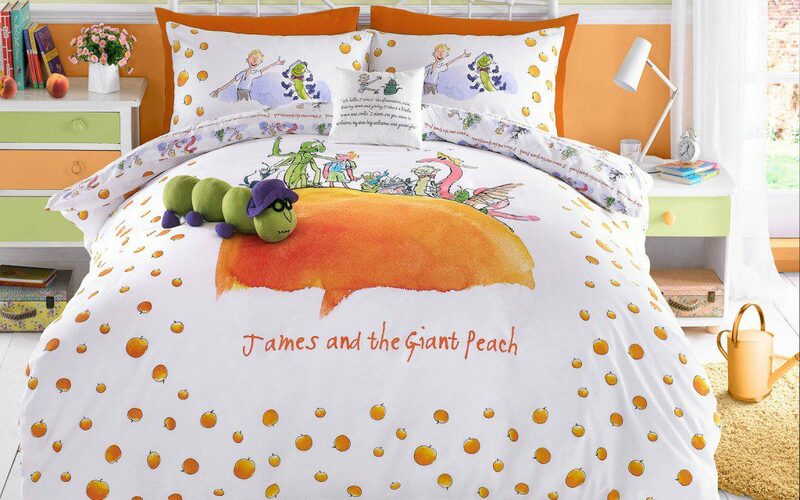 A Fantastic Roald Dahl Inspired Curtains and Bedding Range is now available at Surrey Blinds. Just the name ‘Roald Dahl’ evokes so many childhood memories for me, as well as recollections of reading these books to my children, and I am fairly sure that I am not alone in this. I love the inventive words he uses and the images they conjure up fit so well that you know exactly what he is talking about. Whether its Lickswishy sweets or Scrumdidilyumptious chocolate, and the New Range of Dahl inspired bedlinen shows this off beautifully well. I would have loved decorating my children’s bedrooms with the New Roald Dahl Range of Curtains, Bed linens and quirky cushions – alas they are all grown up now – but I would have loved to have seen their faces as another piece of their imagination comes to life. All of the images are carefully and faithfully reproduced from Quentin Blake’s extraordinary drawings and these are coupled with some of the most famous quotes from the Roald Dahl books. Imagine going to sleep with your head resting on a Golden Ticket, or hugging a pretty Sophie shaped cushion as you look out of the window for the BFG…. In our Guildford Showroom we have a display of the beautiful Curtains, bedlinen and cushions, so why not pop in to take a look?